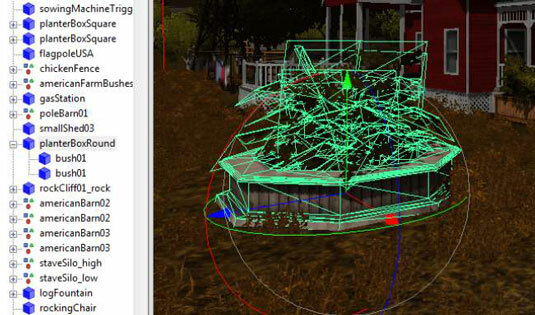 To select assets in Farming Simulator, you can simply click on objects on the map. However, some objects in the scene are difficult to see, and others are only selectable after you drill down through their parent objects. You can also use the Scenegraph to select exactly the assets in which you’re interested. When you make a selection in the 3D Viewport, look at the Scenegraph. Most objects are actually a group of assets hierarchically organized such that they’re children of a parent object. The Scenegraph panel automatically updates and scrolls to your current selection. If your intent is to move or copy the whole object, you want to make sure that you select the parent. Doing so ensures that you also select all the child assets. In fact, you’ll probably find yourself making selections in the Scenegraph at least as often as in the 3D Viewport. Because you’re using the Scenegraph so often, make sure that your objects have clear, logical names that reflect what they are or what they do. You can easily get frustrated and confused if you find yourself making selections in a map where everything is named mesh01 instead of waterPump, oldBarn, and uglyTree, for example.